Well, here we are. Summer! Just when it seemed like it would never get here, the kids are school-free and I’ve got summertime on the brain. For my money, there’s nothing more summery than an ice cold cherry limeade. You know, the sweet, syrupy kind with a lime wedge and cherry on top? This tantalizing Cherry Lime Vodka Tonic is just like that…with an adult twist. Just look at this gorgeous color! 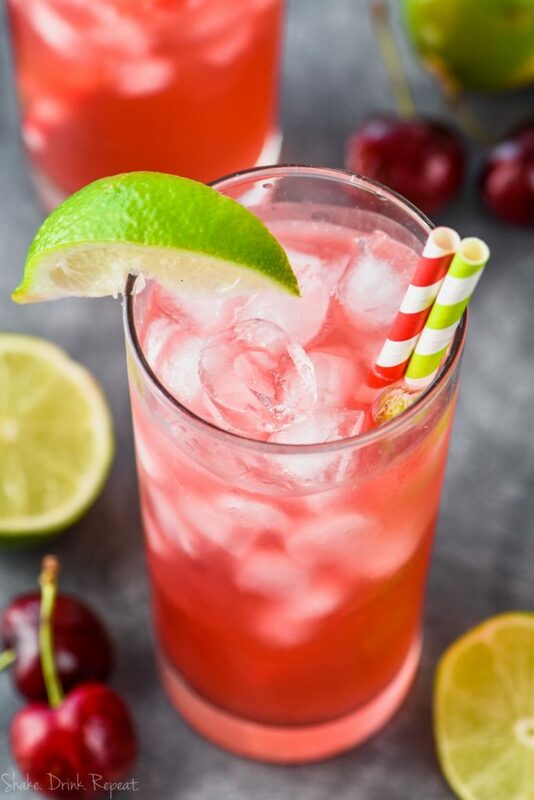 This fruity vodka tonic variation starts with my kid-friendly Cherry Limeade recipe and kicks it up a notch. 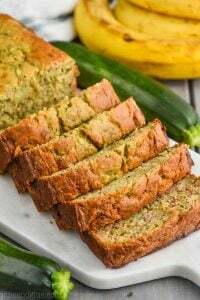 So you could whip up a batch for the kids, and then add a couple of vodka tonic ingredients to create a grown-up version that you and your friends will LOVE sipping all summer long! 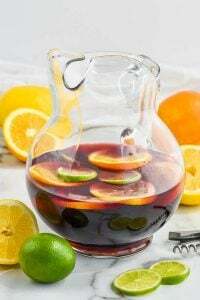 This Cherry Limeade Sangria or this Cherry Lime Tequila Cocktail are a couple more favorites for cherry lovers. And if lime floats your boat, Key Lime Infused Vodka is a delicious drink to try. 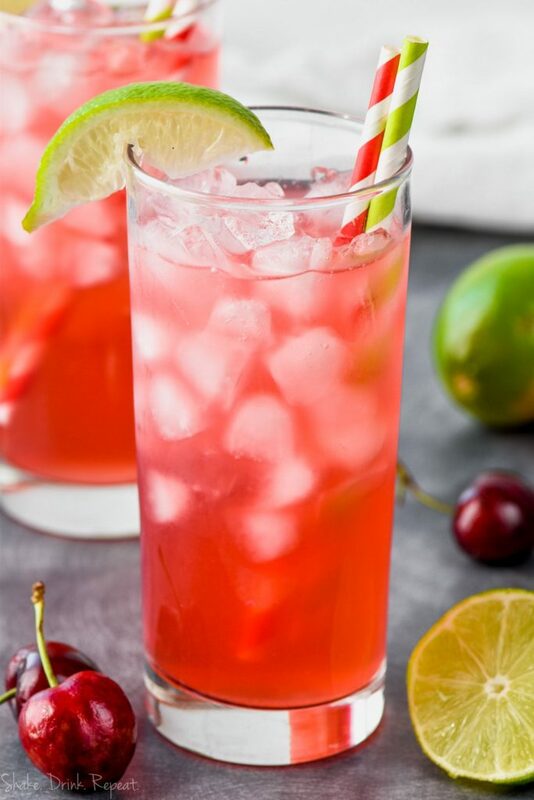 WHAT INGREDIENTS DO I NEED FOR A CHERRY LIME VODKA TONIC? Just like the name implies, start with some simple and sweet Cherry Limeade. 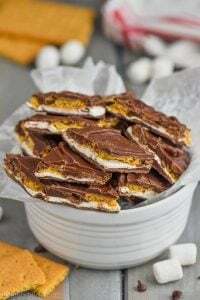 It’s so easy to make and your kids will absolutely go nuts for the sweet and tart combination. I love cherry vodka for this cocktail, but you could always use regular vodka if that’s what you have on hand. And finally, some refreshing tonic. 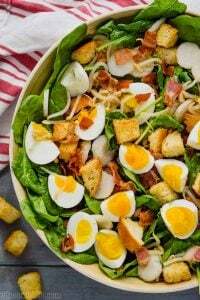 I used diet tonic for this recipe, which reduces the calorie count, but definitely not the flavor. Try it in my classic Perfect Gin and Tonic Recipe or this Grapefruit Lemongrass Lime Infused Gin and Tonic Cocktail. This three-ingredient thirst quencher comes together so easily, you won’t believe it! 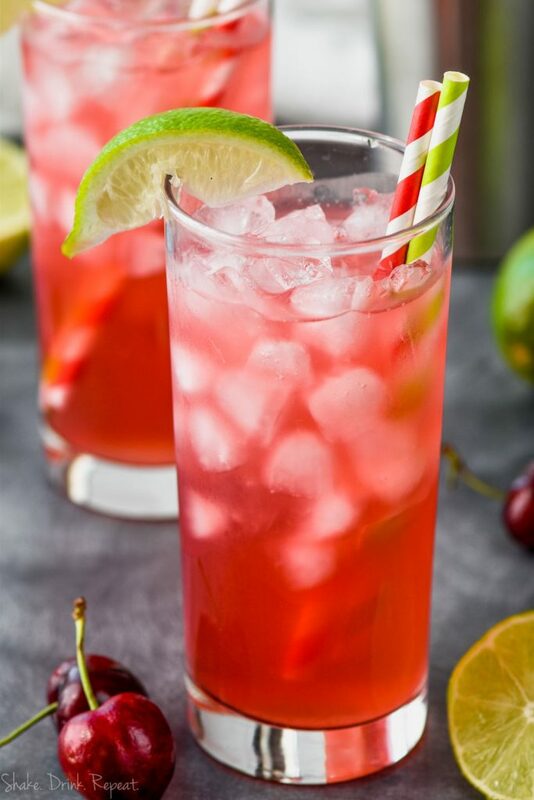 Simply combine a couple ounces of cherry vodka (or regular) with a couple ounces of cherry limeade together. Shake with ice, then strain into an ice-filled glass. Top the rest of the glass with tonic, garnish with a lime and cherry and bam! You’re in for a real summer treat! This cocktail is sweet but not too sweet, tart but won’t leave you puckered. It’s one of the tastiest low-calorie vodka tonic recipes ever! Looking for some more sweet cocktails to share this summer? Try my Cherry Moscow Mule or this Peach Vodka Smash. 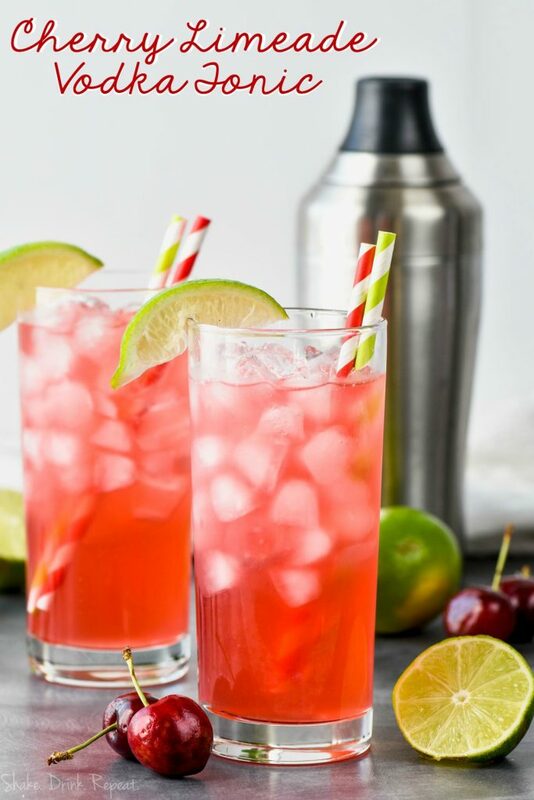 This Cherry Lime Vodka Tonic is the perfect amount of sweet and tart. Such a delicious and refreshing drink that is only three ingredients! Shake together the cherry limeade and the vodka with ice. Strain into a glass filled with ice.